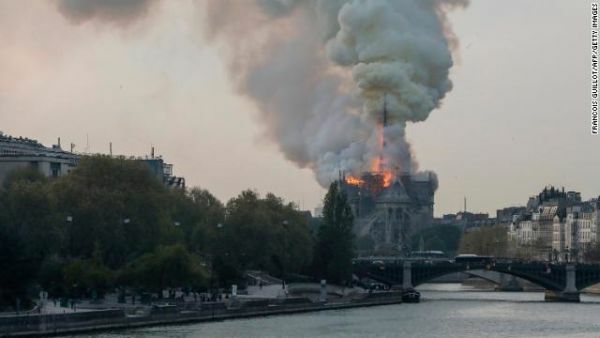 Notre Dame is on fire - really, the real Notre Dame! Re: Notre Dame is on fire - really, the real Notre Dame! Ya, on TV stream now. Holy moly! That is gonna be a LOT of damage! A niece is there, sent us photos she took from the street. Not good. I saw where they think it is attributed to a construction crew working there. No, they said in or near the construction area..Just a starting point,but not how it started..
France has seen a spate of attacks against Catholic churches since the start of the year, vandalism that has included arson and desecration.Vandals have smashed statues, knocked down tabernacles, scattered or destroyed the Eucharist and torn down crosses, sparking fears of a rise in anti-Catholic sentiment in the country. Dang! That is a real shame. Wikipedia changes are quick as the first sentence about this structure has already been edited to have the "was" in it. I had never gotten to see that one, but I did visit the Notre-Dame Cathedral Basilica of Saigon. Beautiful architecture. All the talk about rebuilding it is wishful thinking. They were looking at a $200 million dollar renovation. Imagine the cost of rebuilding, won't happen. It will be rebuilt, stone by stone. Not going to be able to replace the artwork, the carvings, the paintings, the murals, or the sense of wonder that just standing there brings. Stone by stone over the centuries. Was just looking at a slide show of some of it's decor, on wiki. Now where da hek is hunchyback gonna hang out? What a waste of art and history. They started building it in the 1100's. Those beautimus rose windows must have taken many years each to build. All in the 1200's. Leaded glass. You can rebuild what was lost, but it will still be just a replica of what was. At least they saved a bunch of the art work. I am sick -- as are many in the Western world. But it is also a lesson that the Creator does not necessarily value the "things" we humans do. We all lost something today. That church was old when Columbus set sail and crashed into Cuba, thinking it was China. Flying buttresses, massive arches, phenomenal medieval acoustics - an architectural triumph un rivaled, steeped in history. The rebuild is going to happen, France is asking other countries to help. It must have been insured. Either way isn't it a Catholic Cathedral? So ... other countries like the Vatican? The current renovation was price tagged at $6.7 million. If it was indeed started due to the construction work, you can bet that the contractor's insurance is about to suffer a major hit! The fire is in control now. They are saying the structure itself is still solid and the bell towers are undamaged. The key parts that were destroyed were the roof which is lead plates over timber frame work and the wooden steeple. All things considered the damage is not as bad as it could have been. They have shown images from inside the main sanctuary already on TV and while there is definitely some damage, it is relatively minor in the grand scheme of things. They were also mentioning that the parts of the structure that burned were some of the most untouched parts of the church. Roof timbers that would have been several hundred years old. Many of their most important artifacts were out on display for Holy Week. Would have made them very accessible to save. *Communique of the Press and Communication Service of the Cathedral of Notre-Dame-de-Paris, November 2014. This is truly a sad event, but if they can rebuild Dresden, Germany and the rest of Europe after WWII, they can fix this. Lots of money being pledged right now! Glad they were able to save a lot of the art work. I’m wondering what the health issues are when all that lead boiled away into the atmosphere? The affected area has to be enormous. Yes, it appears the fire did less damage than was feared so a roof can be put back on and a fresh coat of paint to cover the soot. I heard from reporting yesterday that the oak structure took something like 57 acres of old growth oak to complete. This morning I heard some talk of maybe using steel for the rebuild. Sadly the cathedral will never be restored to its former state. And the paintings and artifacts are gone forever. Yeah, I wrote that quickly during a break at work when the radio and news I heard sounded like there was even more extensive damage. Sounds like most of the stone structure is still good and many of the things feared lost actually may be okay. Interesting question for the rebuilding of the damage going forward, do they try to rebuild as close to the original as possible or do they rebuild closer to what they would do now with modern technology and building methods while still maintaining the feeling of the structure? Last night reading that, although the building is 800 years old, there have been a number of changes to it over time and other repairs. So it is not really just an 800 year old time capsule, but a building that has had changes over time. The building represent it's entire 800 year history. My feelings on it now that I know a little more about the extent of the damage and the history of the building, is rebuild the roof with modern methods that still maintain the feeling of the building. Don't try to rebuild a close to original as possible and pretend it is 800 years old. Keep it a living vibrant building what that is a testament to all the ages and all the things the building has been through. But, that is for the French and the Catholics to decide. Sad to see an old building in flames. Just reading on yahoo news about how the roof was originally constructed. In 1200. The oak beams took forever, (literally for some people), to properly season. From the time the trees were felled to the finished beams took approx 50 years. And most of the people that fell the trees, never saw the roof constructed. Pretty amazing procedure, to cure the oak wood. Last edited by Fishfeet; 04-16-2019 at 01:50 PM. Well cross off trip to France too see The real Notre Dam and pencil in Mardi Gras on bourbon street to the bucket list, dats French enough for me. Here in the U.S. there is a tradition of renaming buildings after donors that fund a renovation for it. A few that come to mind here in Oregon: Moda Center, Reser Stadium, Jeld-Wen Field, among others. I just saw that Tim Cook is pledging Apple money. I wonder if they are going to rename Notre Dame the Apple iCathedral? Has a nice ring to it, donut? Well I wasn't there! So hoo nose? The Roman Catholic Church was always into the theater, the show, and the ritual. Even more than they were into young boys. Oh my. Isn't all religion theatrical? Think I'll stay out of this part of the discussion. Seeing as most all my immediate fambly is pretty religious. In fact... twin bro is a minister. But BY GAWD! Someone hasta be the black sheep. Yeah, But I always thought the Roman Catholics were some of the best at it. With all the fancy costumes, the cathedrals, the relics, the incense, the ritual cannibalism, etc. They've kind of tamed it down here in the U.S., but I have spent some time in Latin America where they still do it up right. It can be a pretty good show, especially around Semana Santa. Some of the Baptists are pretty good also. When I lived in Oakland I used to walk by Southern Baptist African American church. Man, the music coming out of there was simply amazing. I seemed to always be dressed in an old t-shirt, shorts and flip flops when I walk by or I'd have gone in. If you've ever been around one these churches you know they always dress in their best Sunday-go-to-meeting outfits and I'd have felt like a schlub going in, but I used to listen for a while outside. If I ever get the chance to 0ne of those snake-handling church events, you know I won't miss the opportunity. That look like some really good theater also. Last edited by Root Hog or Die; 04-16-2019 at 09:27 PM. Recent reports are saying they managed to save ~80% of the artworks and relics. Sounds like once they realized there was a fire, they went immediately to work saving as much as they could. It isn't. The crown of thorns is kept in a special carrier which itself is covered in ornate work but the crown itself appears to be how it originally would have been. Don. Have you ever been to one of those tent revivals? I never had till I was living in Carlton for a few years. I kept hearing a lot of LOUD singing, coming from somewhere in town. Couldn't make out the words, but the tunes sounded familiar. Seeing as it was petty late in the evening, I figured someone was about to get busted for the noise curfew. Decided I'd walk over and see what the ruckus was. HUGE open sided tent jammed full of all the devout, sing their lungs out. And man! That stage was a hoppin' show. The minister was an acrobat. Half expected to see the snakes come out, but didn't stick around long enough. Many years ago when I was a kid. But I like what Root Hog said about the black church and the music he heard. That southern religion music was one of the influences of R&R. I could handle going just for the music. Well, till the preachin' started. But you do have to admire the gothic architecture of the old cathedrals. Far more interesting to me than the pyramids and modern buildings. Donations are pushing $1,000,000,000. Thats a Billion. I thought the Catholic church has plenty of money wrapped up in real estate around the planet. Kinda gross to see a billion bucks going towards a building, when there are so many other things that money can be spent on. Beyond that, I do wonder what kind of insurance they had (or the contractors had to have) obviously not a billion dollars, but I've gotta imagine there was a lot. That's a lot of indulgences. And a lot of absolution as well. I can leave religion aside & mourn for the loss to history, art and the craftsmanship that it required to build that amazing building. Pocket change for some of the bigger donors. The Arnault family and the LVMH Group (that family controls close to 50% of), pledged $226 million. The LVMH Group had $21.5 billion cash on hand at the end of 2017. Tim Cook didn't disclose how much Apple was going to pony up. But last quarter Apple reported $245 billion cash on hand. Last edited by Root Hog or Die; 04-18-2019 at 02:20 PM. That kind of craftsmanship, will never be seen again! Considering the age in which it was accomplished. And Dizzy world donations don't even shine a dim light to the other donors. Theirs will probably just go into the coffers.